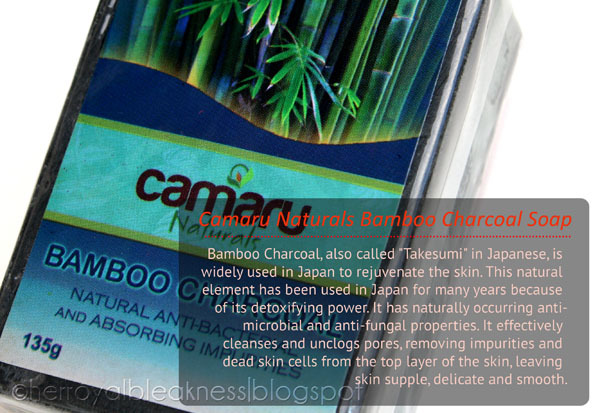 I admit, it's an interesting title that leans to sounding gross, but the heading pretty much sums up this review on what the Camaru Naturals Bamboo Charcoal soap did for my face. I have a set of topical staples in response to pimples choosing my face to be their staple. I get hormonal zits and occasional comedones and I must say that the Camaru Naturals Bamboo Charcoal soap can definitely scare the bejesus out of a blackhead! On Blackheads. I observed that I began effortlessly scraping off a few comedones whenever I apply antiseptic on my skin (6F Clindamycin) with a cotton. On Acne. It helped pus show up immediately on developing pimples. I do not encourage popping pimples, BUT, in cases like this, it's so easy to help the pus out of the skin without having to worry about deep scarring. I let the soap stay only on the problem areas as it has proven to be very drying for my sensitive facial skin. Two minutes max and I start washing the soap off my face. After a day or two, I notice that some comedones come off and zits ripen by showing off its pus! Since I choose to spot-treat the face rather than using it all over, I am unable to check on how the bamboo charcoal soap fares in whitening (at least for the face). I also can't test out for wrinkle improvement and skin tightening for the very reason that these two have yet to be a significant problem for me..
Camaru Naturals Bamboo Charcoal soap will not eliminate zits but can combat skin problems by helping comedones and pus move up the skin's surface for easy extraction. I have observed that the soap has a grander effect on the body than on the face so watch out for part TWO of the this review! Erm, i'm not so sure. And I thought I already sounded gros, lol! It's still safest to use ointments deemed to cure boils. It's not really a cure for acne sis. More of an adjunct to facial cleansing. I hope bf's pimples resolve soon! Sayang walang Gcash payment form. Ang hirap mag access ng banks because of my job. I'm really interested but don't know if I can pay fast. It dried out my skin allergies. I've been very curious about this brand. Is this only available online or I can buy some from a drugstore? I'm also interested to know if it whitens the skin or not?